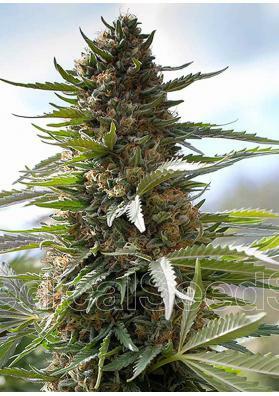 1024 is a feminized sativa-dominant Marijuana strain with a genetics shrouded in mystery usually called "the perfect plant" for having the best features: flavor, presence, production ... An amazing Cannabis strain that was awarded several times. 1024 is a feminized Cannabis strain from Medical Seeds with a misterious genetics kept in secret for security reasons. It is usually called "the perfect plant" for having the best features: taste, presence, production ... and of course, a powerful effect due to its high THC level that can reach 23% if cultivated under optimal environmental conditions, not being recommended for beginner or regular smokers. This plant has an exquisite and unusual flavor harboring a mixture of several flavors: sweet, musky, spicy, fruity. This plant is also considered to be a SUV since it can thrive in any cropping systems yielding outstanding productions. In indoors and after a growing time of 2-3 weeks and a flowering time of 75 to 80 days you can get up to 600 grams per meter square. Outdoors, where it also grows very well, the plant can reach up to 2.5 meters and at the end of October it can give you outstanding yields of more than 1 kg per plant. With all these great features, this strain has been awarded with the 1st prize in 2011 Extraction Spannabis Cup, Barcelona, with the 2nd prize in 2009 Indoor Zaragoza Cup and with the 3rd prize in "The point is you" Cup, Malaga 2009.